Users of MyBatteryLife might assume the app somehow extends the battery life of their iPhone or iPod touch. Watching an iPhone’s battery level is a bit like waiting for a pot full of water to boil, but it’s impossible to believe that your battery could hold 100 percent of its charge after 90 minutes of uninterrupted audio play. Life Goes On: myBatteryLife uses a clean interface to show you how much power you’ve got left, along with how much time you have to perform certain tasks. Well, of course it doesn’t. MyBatteryLife from KVapps is a simple tool of somewhat debatable utility. 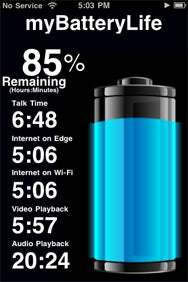 The app’s clean, sparse graphic interface shows a percentage of your battery power, alongside a big blue battery, as well as time remaining (in hours and minutes) for phone usage, Internet using the 3G or EDGE networks or Wi-Fi, video playback and audio playback. If you are looking for a precise gauge of your handheld’s battery life, then MyBatteryLife will be a disappointment. If you are looking for a snapshot approximation of the juice left in your iPhone or iPod touch, then it might be worthwhile. So be reasonable and adjust your expectations accordingly. The older your handheld’s battery is, the less accurate the gauge will be. So you might start with 24 hours of battery time for audio playback, but don’t be surprised if MyBatteryLife says you have 20 hours left after 120 minutes of play.